With the usual suspects going through various personal problems, this is the year when an unknown could pull a Rocky Balboa in the golfing world. Tiger Woods hasn’t been the same since his marriage ended and Phil Mickelson is reportedly suffering from arthritis. Having Woods out of the reckoning might be stretching it too far, but he is in the worst form of his career. Rory McIlroy (a Gorilla Golf Blog favorite…) has been touted as a major contender for championships in both the US and British Open. Currently one of the favorites to win, having started his professional career just two years back, McIlroy is young – that’s good and bad. He is scheduled to play in tournaments all over the globe and is expected to win a lot of them too. If he can maintain his exemplary attitude and his health, he will be one to beat. Wow, a big surprise at the WGC-Accenture Match Play Championship 2011, when Tiger Woods lost to Thomas Bjorn already in the first round. “I blew it,” said Woods and everyone agrees with that. It all came down to the last shot that Woods, while being under extreme pressure, hit into a desert bush. He knew that the game was over and conceded the match to Bjorn. 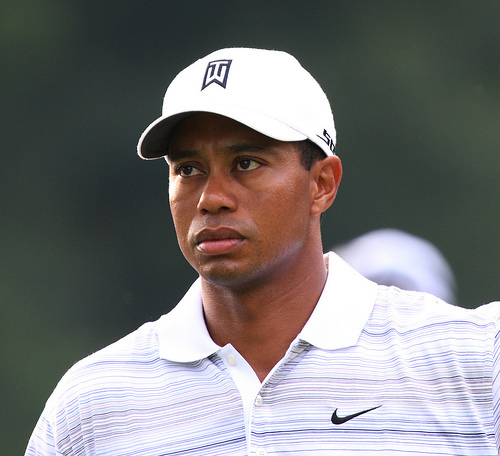 Unfortunately it seems that Tiger Woods is going through a fallback, not comeback. Have you ever wondered why you got your divorce papers so quickly after the wedding? Or why she’s giving you the cold shoulder every Sunday evening after you have enjoyed a golf weekend with complete strangers? 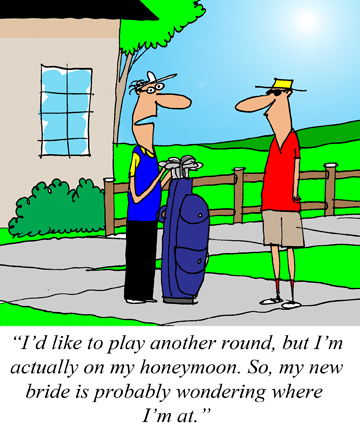 Published here for the first time, we bring you the latest golf cartoons from the great cartoonist Jerry King himself! Eldrick Tont Woods, a.k.a., Tiger Woods, is one of the greatest golfers of all times. Duuhh… Few would challenge this statement. What Woods alone has done for the game of golf is nothing short of extraordinary. People who didn’t know about golf have turned to golf because of Tiger Woods. The man is treated nothing short of a deity in the golfing world. But guess what? Woods is a human being after all! This point came to the fore during the last year when his marital life collapsed in the face of his confession of infidelity. What should have been a personal matter between husband and wife was turned into full-blown breaking news by the media. That didn’t help at all and the marriage ended in divorce. Golf has become a preferred recreational activity for people. Considered an elitist sport for many years, golf has increased in popularity over the decades and is now one of the most popular sports in the world. Golf is still said to be a sport based on honor. Since golf includes a lot of precision to play, golfers have to abide by the rules of golfing strictly. This has been a problem for many golfers as there are such minute rules that have led to their downfall in golf. There have been many incidents in the golfing world where world-class players have been brought down by the rules. The players call it ‘the rule monster’, but being a professional sportsman requires everyone to follow the rules, however small or outrageous they might be. 2011 is set to be a great year for golf. Avid golf fans will have plenty of golfing action to savor as the year presents many championships and tournaments. The major championships this year include the men’s, women’s and seniors’ championships, a total of 13 tournaments. Tiger Woods is expected to re-emerge from his personal problems and win a championship. On the whole, it looks like a very tempting feast for golf aficionados. Here is a first 6 month overview of the biggest upcoming golf championships on the PGA and LPGA tours in 2011 and what you can expect from them. We were wondering last week whether Tiger Woods is able to make a comeback during the Omega Dubai Desert Classic 2011, but it seems that the whole event has been overshadowed by Woods spitting on the 12th green. Apparently it’s pretty common that Woods is spitting due to allergies and cold, but never on TV. Should we be shocked, disappointed and demand his apologies? Maybe it’s the case that everyone still expects great things from Woods and when he doesn’t deliver, then the media finds a way to bring him to the spotlight. Unfortunately all of those spotlight stories have been quite negative, thrashing Woods to the ground. Perhaps it’s time to focus on newcomers and bring out the positive side of golf to inspire thousands with this beautiful game. Don’t forget that Sergio Garcia spat into the cup back in 2007 when he missed a shot on the 13th green. That’s far more disgusting and we’re not sure if he even got fined. Is that fair?